An important element in wildly successful sewing experiences is the space where you sew. In a perfect world, you’d be able to leave your sewing machine and other supplies out when you have to stop working on a project. For many, that just isn’t possible. So thinking outside the box may be important as you create sewing space in your home. 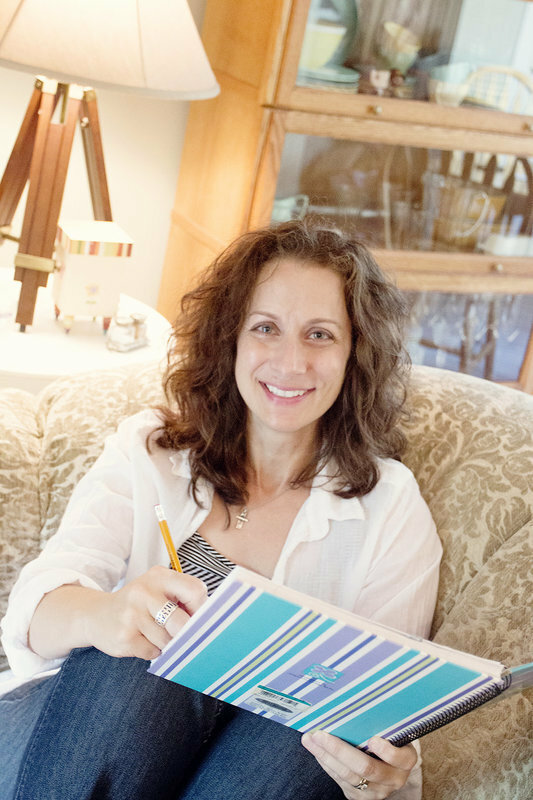 If there’s a room in your home you can dedicate to sewing or at least a room where you can leave your sewing machine and supplies out when you aren’t working on a project, that’s where you want to create your sewing space. However, if all the rooms in your home already have a dedicated use, you’ll need to determine where you’ll create your pop-up sewing space. This is a space where you can quickly set up and take down your sewing machine and supplies without a lot of hassle and disruption to you and your family’s daily life. The time you spend on sewing will depend on what else is going on in your life. You may be able to sew every day, once or twice a week in the evenings, or every other weekend. More than likely, the time you’re able to spend on sewing will vary from week to week and project to project. Keep in mind how much time you can dedicate to sewing as you figure out where the best place in your home would be to create your pop-up sewing space. 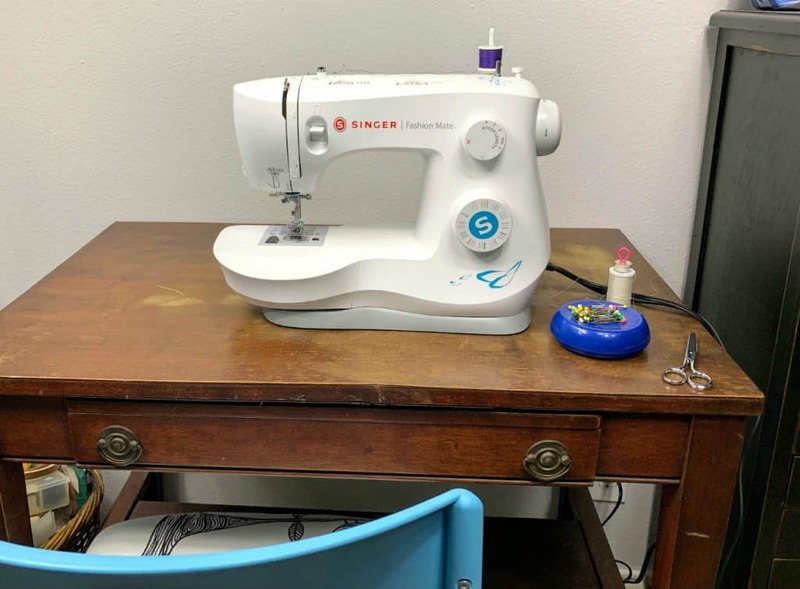 If you’re able to sew several times a week, consider finding a spot in the corner of a room where you can set up your machine and supplies and leave it all out as you work on a project. You’ll enjoy sewing so much more if you don’t have to set up your sewing area every time you want to sew. Will you be a weekend sewer? Maybe the kitchen table is where you can create your pop-up sewing space. You set it up for a couple of days then put everything away during the week. Sewing tends to involve a constant flow of movement from one zone to another. The Cutting Zone is the place where you’ll lay out fabric and pattern pieces, cut fabric, etc. 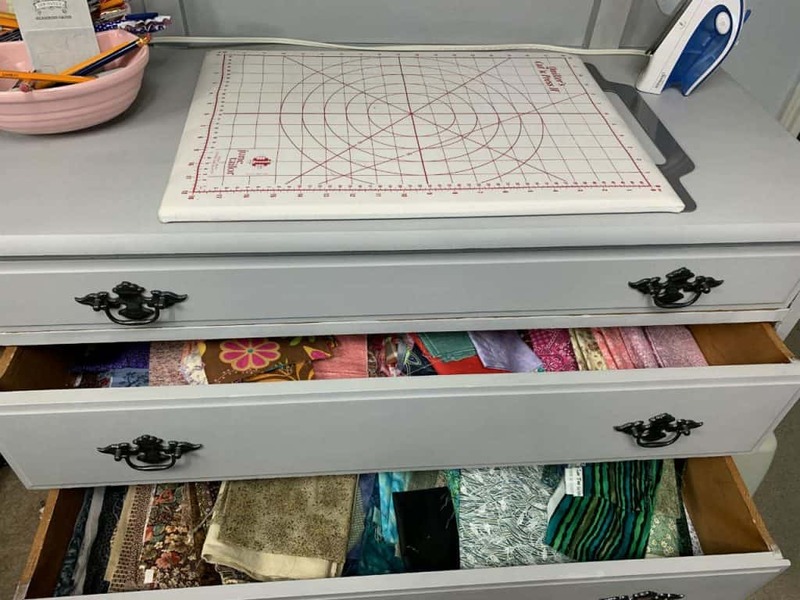 It needs to be a space with a flat, smooth surface where you can spread out fabric, pin pattern pieces, cut fabric, and lay projects out as you pin pieces together and construct your project. My most recent cutting zone is a repurposed workbench. The Cutting Zone is the place where you unfold the cardboard pattern cutting board for large pieces of fabric or lay out the rotary cutting mat for smaller pieces. Your sewing machine will go in the Sewing Zone. Make sure there’s an electrical outlet near your sewing machine so it’s easy to plug in. Lighting is also important as you determine the best place to put your machine. Consider the time of day when you’ll be sewing. If you’ll sew during the day is there a window where you would benefit from natural sunlight? If you’ll sew in the evening, you’ll need a lamp or overhead light that illuminates the Sewing Zone. There should be enough room on your sewing table to hold, at a minimum, pins and a pair of scissors. In addition, there should be room on the left side and behind your sewing machine to support the fabric as you sew. My current sewing zone includes an antique table and an Ikea chair. The chair you sit in as you sew should be comfortable and allow you to move freely. A chair without arms works well as a sewing chair. A trash can or some type of container for scraps and threads is beneficial in the Sewing Zone. Throwing scraps and threads away as you sew makes clean up quick when you finish with a project or need to break down your sewing space. For many projects, it’s important to press as you sew. Pressing helps set stitches, flattens seams, and elevates the overall appearance of finished projects. You need a board and an iron in the Pressing Zone. This could be a full sized ironing board and iron if your project consists of long seams and larger pieces of fabric. You could also use a small board and travel-size iron if you’re working with smaller pieces of fabric. A dresser top serves as a small pressing zone. I use the drawers to store fabric. The Pressing Zone should be located near the Sewing Zone because you’ll be going back and forth between them as you work on your project. In a perfect world, all of your sewing supplies would be stored in the same location. That’s not always possible. Depending on your home and the amount of sewing stuff you have, your Storage Zone may need to be located in different places. If your sewing space needs to be a pop-up space, you want to store your frequently used tools in a sewing box or basket. This will allow you to keep your tools in one place for easy setup and breakdown of your space. Your sewing machine, ironing board, small pressing board, iron, and cutting mat may need to be stored if you don’t have a designated sewing space where you can leave them out all the time. A closet or corner of a room works well for these items. Try to keep them all together, if you can, for easy setup and breakdown of your space. Thread, interfacing, and trim are some of the supplies you may collect depending on the type of projects you sew. These can be stored in containers or on a closet shelf for easy access. Books and patterns are stored easily on a bookshelf. 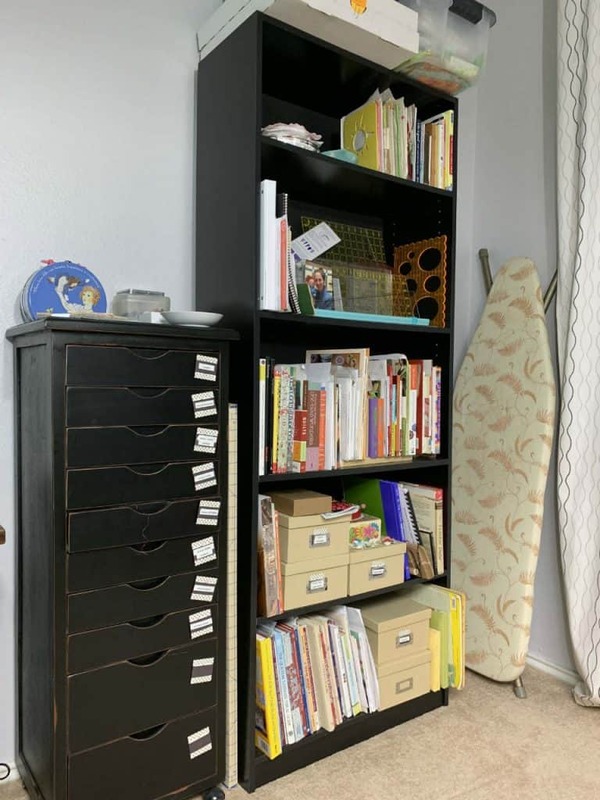 The bookshelf holds books, patterns, and cutting rulers. Some of my unfinished projects are stored on the top. The ironing board leans against the wall until I need it. Thread, pins, and other notions are stored in the multi-drawered piece. Fabric can be folded and stored in a chest of drawers or in a closet. Depending on how much fabric you have, it can be organized by color and separated in bins or baskets. If the amount of fabric is a yard or more, it can be hung on hangers and stored in a closet. It’s not uncommon to begin working on a new project before you finish your current project. You may find yourself side-tracked by a project that catches your eye, get tired of something you’re working on, or even find yourself frustrated by the construction of an item and need to take a break from it. Regardless of the reason, you’ll need a plan for storing unfinished projects. Bins, baskets, drawers, and bags are all good options. It’s a good idea to store any of the notions and supplies you bought to complete the project with it. That way when you’re ready to sew on it again, you won’t need to hunt and find everything. 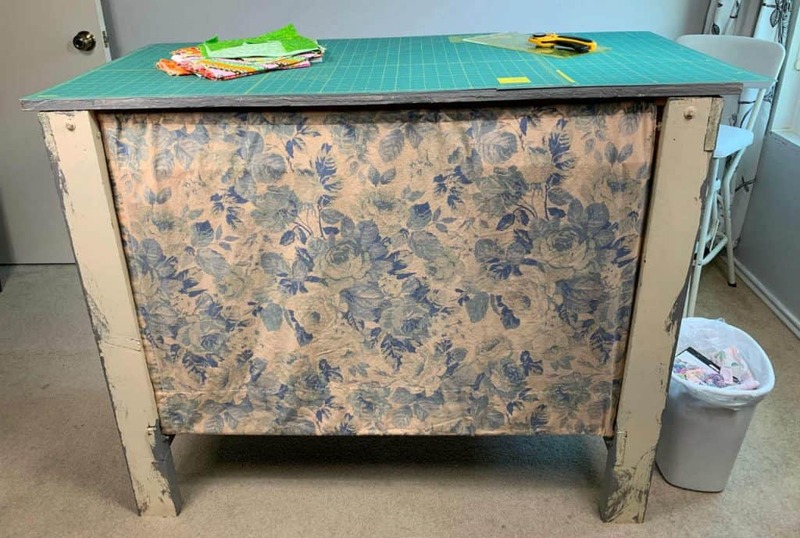 For almost 25 years I had a semi-permanent pop-up sewing space. I could leave my sewing stuff out for a week or two but would always need to get it cleaned up for one reason or another. Many times I used the kitchen table for my Cutting and Sewing Zones. The layout of the houses we lived in over the years were open floor plans. So, when my son and husband were in the living room and I was sewing, we were all together even if we were doing different things. My husband ironed all of our clothes in the living room while he watched TV. He would leave the ironing board and iron out when I was working on a sewing project. They were set up near the kitchen, so my Pressing Zone was near my Cutting and Sewing Zones. My Storage Zone for several years consisted of a sewing basket that held small sewing tools and supplies. A portion of our hall closet held fabric and other supplies I wanted and needed for future projects. When I wasn’t sewing, my machine and large supplies were stored in the spare bedroom/office. The ironing board and iron were kept in the laundry room. Throughout the years, the number of notions and sewing supplies I have has increased as has my fabric stash. When we moved into the house we live in now in 2008, we attended a local auction and bought a great piece of furniture…an armoire with 4 doors! It fit perfectly in our main living space and was in excellent condition. I was able to store almost all of my fabric and sewing supplies in one place. In October of 2018, my 24-year-old son moved to California. Sad to see him move so far away, but secretly happy there was finally a free room in our home, I’ve been transforming his bedroom into my permanent sewing space. I now have everything in one place and can leave my sewing stuff out all the time. The only thing I can’t do is layout large pieces of fabric. I still use my kitchen table (with the risers) because it’s the largest flat surface in our home. All the pictures included in this post show the different zones in my sewing space. While my son’s old bedroom is a place where I can do my sewing, the entire space is a work in progress. I have so many ideas of things I want to do in my sewing room to maximize function and stimulate creativity. I’ll eventually get around to making those changes, but until then I can make and create in my very own space. Consider the space available in your home as well as how much time you’ll be able to spend on sewing. Will your sewing space be set up permanently in one room or will it need to be a pop-up space? Sewing tends to involve a constant flow of movement from one zone to another. The ideal sewing space would have these four zones all in one area. Your sewing space and all the items in it will grow and evolve as your sewing skills improve. Sewing is a lot of fun, and your sewing space is a key player in having wildly successful sewing experiences. You did it! You just finished the Get Ready to Sew! series. If you missed any of the previous 11 articles or lessons, check out the main page for Get Ready to Sew!